IBA Sweden is proud to announce that we are appointed to host the IBA European Tour 2018! This is the third running of this event, starting in 2014 and has been arranged biennial since. The 2018 issue of the European Tour will be held in a 72-hour format. Reason for this is an effort to bridge the gap between the 24-hour rallies and the longer 5-day or even more challenging events. * There will be no compulsory checkpoint-stop. * Start and finish at the same point, close to Husqvarna - located just a 2-3 hour ride from any ferry or bridge entry point in Sweden. * Rally book in English and Swedish. Presentation in English and Swedish. German is spoken, and clarifications can be held in German. Questions in German will be answered in German. * There will be a special treat for participants riding in from Mongolia. Starting fee includes the rally itself, rally book, a great T-shirt to all starting riders, prizes to podium finishers and a buffet dinner just before the riders meeting. No other meals are included in this price, and no lodging. * Registration opens now! 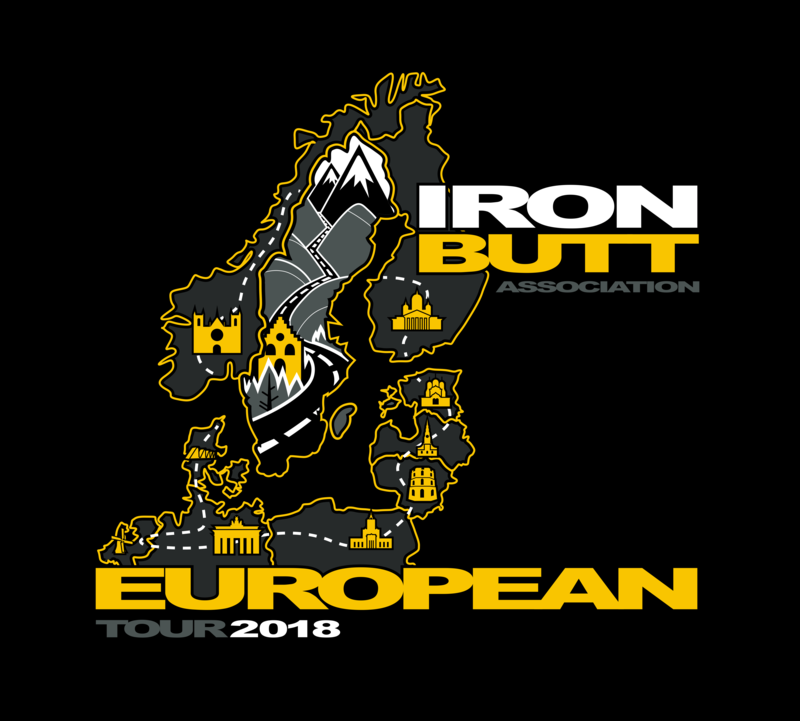 Please send an email to events (&) ironbutt.se with your details and T-shirt size and we will supply the details for payment and hotel booking. First entry after just more than one hour. First international entry after less than 6 hours. Yes, your email of September 3rd was indeed answered on September 4th. ...guess I was out riding on Sunday afternoon. Sorry for that! The thing that is stalling us somewhat is the hotel part. We want good price, good communications, good wifi, good parking - and bsrtd Robert rreeaallllyy raised the bar down there at Miesbach. But we'll come around. We have two locations that needs to be inspected this week, and then we are ready to launch the hotel details. In the meantime, registration is still open. Anyone wanting to participate have only to send us an email with their basic data, and we'll slot you in. And, as earlier conveyed: the starting point is located somewhere in the southern part of Sweden, not more than 2-3 hours ride from any entry point served by ferry or bridge. That's all we can say for now. This is the thread for the 3-day 2018 European Tour. Send email for Conny and me. the Mongols shud hit europe by mid/2H but I wont be riding this rally may come up of course as a volunteer scoring help or whatever if needed!! Nice to see so many riders signing up already. It will be in very close vicinty to Husqvarna - yes, there is a town named after the classic motorcycle brand. The ones already registred will have an email with all the details before the evening today. Okay, will check as soon as I am back on my stationary unit. Will resend rund noon today. Will post here when sent. So, Newletter 1 has been sent again. Some may have recieved it twice, some once - but no one awaiting news should be without it by now. If you have recived it twice, then please just discard the second mail. There is no new info hiding in the second issue. Thanks, some clarifications might be needed....until when the fee has to be paid (or registration will be dropped)? Is number of participants limited? "How much did you earn last year?" "How much do you have left?" "Please deposit this sum to the IRS"
The one pronounced deadline to observe is the hotel that needs to be booked as soon as possible. Please do not drag your feet on booking your room - we actually have negotiated very generous rules on room cancellation so there is no need to await the next end of the world-date. Just get a room, okay? On the rally itself there is of course a first come, first served policy. No registration is complete without confirmed payment, but we would be fools to start grasping for money now already. Anyone experiencing trouble to store all their money in their bank account is free to pay now already to have their slot secured, but we will issue a heads-up when we are reaching the maximum number of participants. A rough guestimation is that we towards the end of this year would like to see payment from the ones hat have not yet paid. Any alteration will be announced.